FirstEscapeGames Chinese Residence info about the game-Games2Rule. 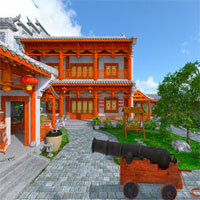 FEG Escape Game: Chinese Residence is another point and click escape game developed by First Escape Games. Assume that you are staying in a typical Chinese style residence, as you are in China for a trip. This building looks very impressive and elegant. You are now trapped in the building and you don’t know how to get out. You have tried all possible ways to escape from the building, but you are still inside it. Use your puzzle solving skills and escape from the Chinese residence. Good luck and have fun!